Kendra of Catholic All Year, very kindly bestowed upon me the honor of the Liebster Award. And I very graciously decided to follow up on it, only about 5 days after the fact. Oops! How it works: I'm paraphrasing here, but I think the rules are 1. answer the questions 2. tag others as award recipients 3. give them a new batch of questions. Houston, Texas. It's where my husband was living when we met, and where he spent a large chunk of growing up, at least when he wasn't in Oklahoma or Norway. I moved here after we were engaged and I've kind of embraced Texas life (see my blog header). And then go read this article about just how big Texas is. In recent weeks, I have cut way back on pumping, so my TV time is much more limited. 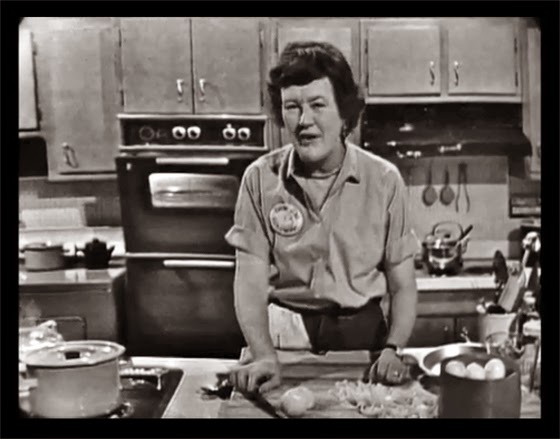 The two times a day, I do pump, if I'm not catching up on blogs, I watch Julia Child's original PBS show "The French Chef." I love how relaxed she is on camera, picking the food to try it, wiping her eyes if they need it, pouring too much vinegar on accident, but then showing you why that's nothing to fret over. She's the best. If you're more into gritty dramas, before I cut back on my TV watching, I was watching "Justified" on Amazon Prime; it's about US Marshall in backwoods Kentucky. For a stay-at-home date night, I've got the Veronica Mars movie ready to go (also via Amazon). As for reading, I'll bashfully admit that I bought "Introduction to the Devout Life" after Kendra talked it up so much and am just putting my toe in the water with that one. 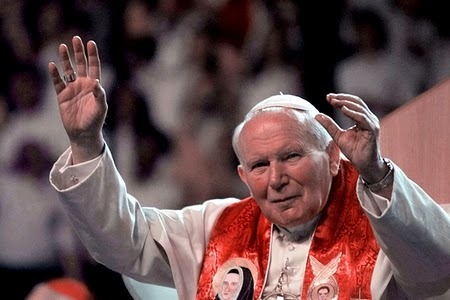 John Paul II came to my hometown when I was in eighth grade. Seeing him there, and at the Rome and Toronto World Youth Days grounded me in my faith and convinced me how much the strength of the Church relies on the fidelity of each of us. I'll ever forget him calling out in St. Louis's hockey arena "Even though you are young [...] Remember, Christ is calling you; the Church needs you; the Pope believes in you, and he expects great things of you!" *sidenote* when he came to St. Louis in '99, my mom had a sweatshirt made for my youngest brother, who was two at the time, that said "My Name is John Paul Too" Just a little apparel idea for all those JPII namesakes out there for the canonization. Please excuse, the photo of a photo. This picture hangs in my mom's living room. 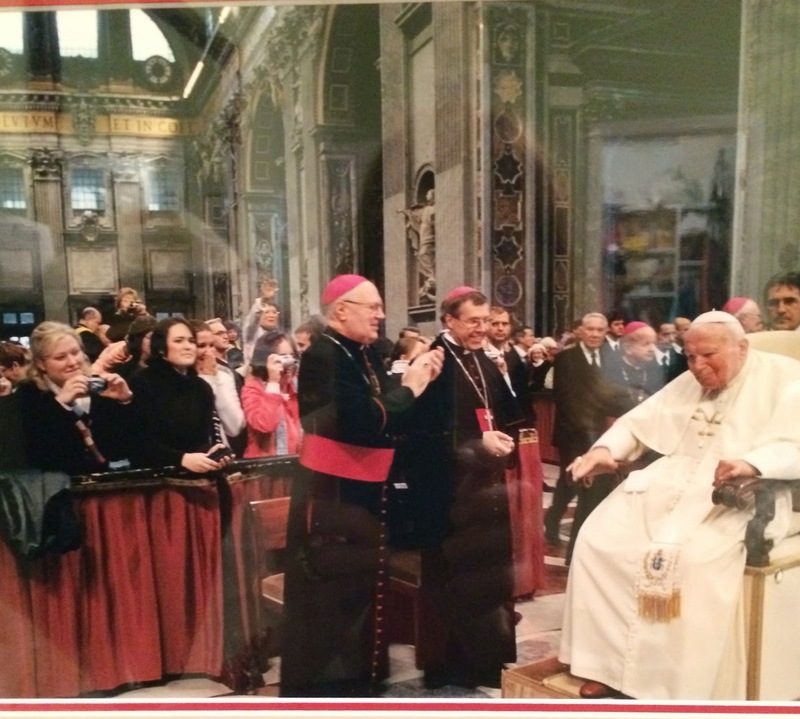 Taken during a general audience in December 2004, this was the last time I saw John Paul II before he passed away. If you include the heels I wore at our wedding, that my husband won't let me get rid of, 13. Is that a lot? Yes, and no. "Dance like no one is watching" dancer?, definitely no. But a dance with a partner, ie. someone leads, someone follows, yes. That talent comes in way less handy. It's a little off the beaten path and even a little somber in memory (for us), but I love Holy Thursday. Growing up, every Holy Thursday, my parents would take the family out to a fancy restaurant after the evening Mass. You don't make it into to many fancy restaurants when you're 11. Mark and I have kept up the tradition. The day also has added significance for us since in 2011, I miscarried our first baby on Holy Thursday. Keeping that tradition has been our way of remembering him. Generally, I'd have to say the photo on the left, but I'm not sure I have a horse in this race anymore. 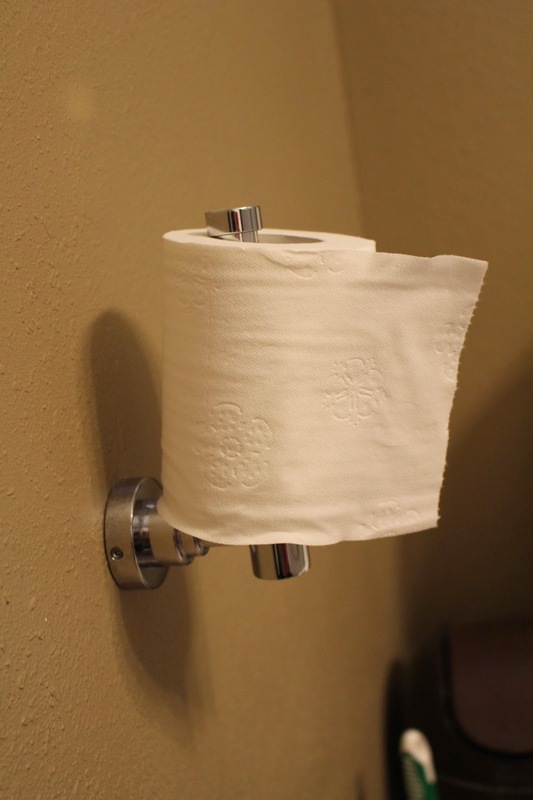 Here's what the toilet paper holder looks like in our hall bath. That is vertical; so really there is not right answer. 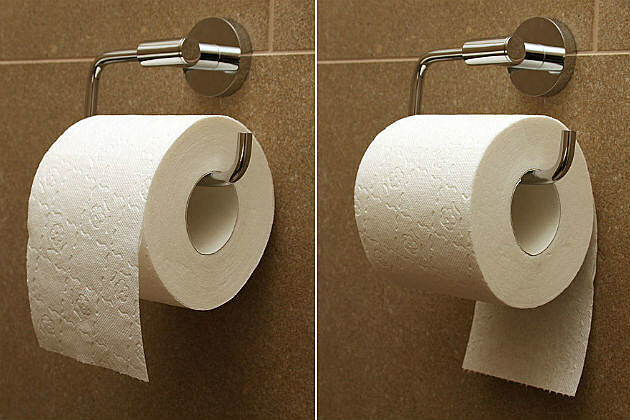 Our toilet paper holder is a relativist. Um, several: one under my chin when I got stitches in kindergarten, 5 from my surgery this past December, including the reconstruction of my belly button, which is where the video camera went. TMI? Basically, my stomach looks like a number 5 domino. And then a seven inch c-section scar across my lower abdomen to round it all out. 2013 put me through the wringer. At least the two scars from my surgery in 2012 have disappeared, or were absorbed by the c-section incision. In high school, I had the lead in the musical two years running. I was Maria in The Sound of Music junior year. And Anna in The King and I, senior year. Apparently, I do a really good governess. 1. What apps (aside from the defaults) have earned a coveted space on your homescreen? 2. Name the meal for which you always have the ingredients on hand? 3. What movie have you seen the most often? 4. What saint do you pray to the most? 5. Is where you live known for anything? Toasted Ravioli? World's Largest Rocking Chair, that sort of thing. 6. Favorite literary heroine and why? 7. What was your most endearing childhood trait? 8. What's on your pizza?